Most binoculars spend most of their existence buried inside a closet, or perhaps inside a spacious drawer. A few naughty binoculars have only observed the nasty habits of someone’s unaware neighbor, and a lonesome binocular can do nothing but collect time snow (dust). Binoculars are intuitive and easy to use. A telescope needs eyepieces or a variety of other tools, but binoculars are the total package. You can just grab ’em and go. Simple as that. A typical binocular can easily be stored, and will always guarantee a visual boost when desired. Most telescopes are designed to specifically explore the night sky, but any binocular can be used during the day—even instruments designed for astronomy. Can any binocular really be used to observe the night sky? All binoculars provide a wide-angle view of the night sky, especially compared to a telescope. Wide-angle observation offers a variety of advantages. Binoculars grant a sense of freedom. You can pick a part of the sky and see what’s there. Not very scientific. Kind of sloppy. And carefree. Telescopes need to be physically operated, and usually a destination is predetermined. You can sway a telescope toward a random part of the sky, but the field of view will still be quite restrictive, so the chance of actually seeing anything (besides stars) is too small to care about. Sorry. What if you’re not in the mood to fiddle around with Barlow lenses and reflex sights? It’s peaceful to simply explore the night sky and not have to worry about polar alignment, eyepieces, filters, finder scopes, or mounts. The sky is really BIG. A binocular’s angle of view is comfortably wide, especially compared to a telescope. They’re also easy to maintain. If a binocular is not used and abused, then it can last a lifetime. Most binoculars are somewhat rugged, but that doesn’t mean you should be careless. Not every binocular is suitable for astronomy. Expect a $10 binocular to give you a $10 view of the universe. But so what, right? A $10 view is better than no view. Don’t be discouraged and sulk indoors. If you like what you see with the binocular you currently own, then acquire one that’s specifically designed for night sky observation. A $100 binocular is a far better investment than a $100 telescope. Most $100 telescopes will fall apart under the sheer might of a pixie’s fart, but a similarly priced binocular will out perform and outlast any cheap telescope. The optical quality will most likely be far more respectable. …have you ever wondered what those cryptic numbers mean? The numbers look a little something like this. The first number represents power. The second number represents the front aperture size (in millimeters). Pretty simple, right? Even a relatively big binocular will provide a sweeping view of the night sky. There’s a limit to what is practical to hold, though. Large binoculars require specialized mounts. Weight and other issues make it impractical or undesirable to hold by hand. A large binocular can still be used without a mount, but the image needs to be stabilized. Other weird phrases can potentially be printed on a binocular. Fully multi-coated means that all the air-to-glass lens’s in the binocular are coated with multiple layers of magnesium fluoride. The magnesium fluoride transmits up to 90% of the light entering through the binocular. BAK-4 prisms refers to the quality of glass—barium crown. BAK-7 prisms are considered inferior due to the poor quality of glass and they’re generally not used for binoculars designed for astronomy. Astronomical binoculars will have most of the lenses multi-coated. Specialized astronomical binoculars will also utilize BAK-4 prisms. Ignore ruby coated lenses, okay? Perhaps ruby lenses appear to have magical qualities, but they don’t. The crimson smear detrimentally impacts optical quality. Try to obtain a fully multi-coated BAK-4 prisms binocular. These types of instruments provide optimum light transmission. If you think light transmission is important when it comes to astronomical binoculars, then you’re absolutely correct! Now you have a convenient excuse to carry a binocular. If you’re ever confronted by your neighbor, then just tell ’em you’re looking at the night sky. Keep in mind: if you plan to hold a binocular by hand, then try not to go beyond 10x power. The lower the power, the wider the angle of view. High power binoculars are prone to shaking, and it’s simply not practical to physically hold a binocular that’s above 15x. A 15x binocular is technically too much power to hold by hand, but if you’re able to brace against a tree or car, then it’s possible. The image will probably still shake, though. 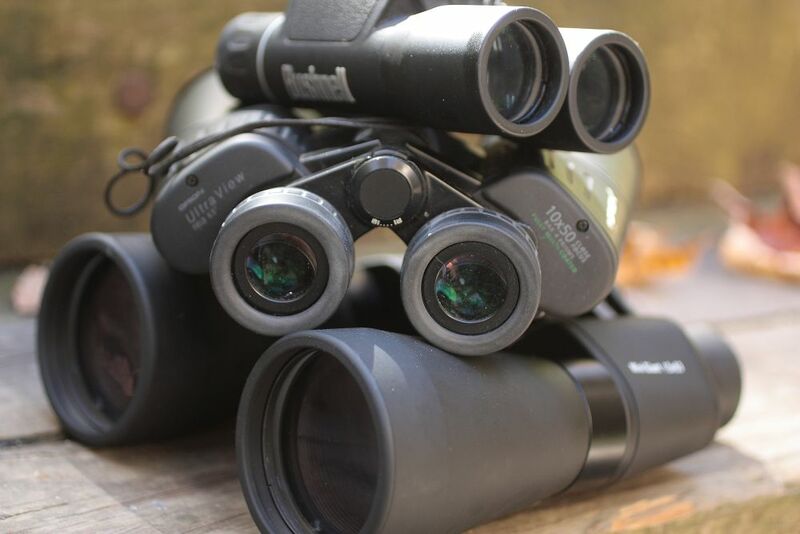 A 10x 50 binocular is an ideal compromise between power and size. You’re right — exit pupil should also be considered. I never used an adjustable binocular, but I imagine they’re versatile. I also should have mentioned that larger lenses collect more light, which would be useful for astronomy and birding. Thanks for reading! Your tips are much appreciated. Great! Your binocular is excited! Let me know when you observe the Moon. I shall look at my binoculars with different eyes now. I just took them for granted, sitting on a shelf, hidden from my attention. You’d be surprised what you can see with a binocular — even if it’s relatively small. You should try observing the Moon. Let me know if you have any issues or questions! Thanks for reading. I will use it for that! Great article and how to. Yes, I love my bins..they let me peer closer into the milky way en the moon;s craters. Great for bird watching..do not care for people watching…, i use the camera for that!! super stuff. Binoculars are definitely underrated, and they’re also cost-effective. Thanks for reading!